Blogs is Watching - A Seattle hip-hop lifestyle blog. (SEATTLE HIP HOP): Neema - Light That Fire f/ Mistah F.A.B. 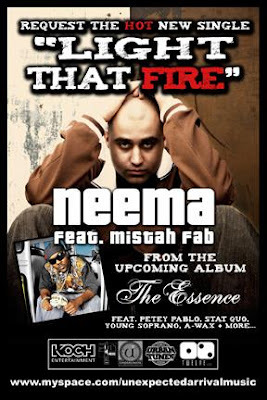 Neema - Light That Fire f/ Mistah F.A.B. Seattle Sound has the lead-off single off Neema's upcoming release, The Essence. It's the Song of the Day on the Sound website so be sure to check it out and Light That Fire by clicking here.